In the interests of Internet Karma..(ie, when I get Mr Shiny.com going someone will plug me...and promote me)Here's something a bit left of the radar, which I really like. 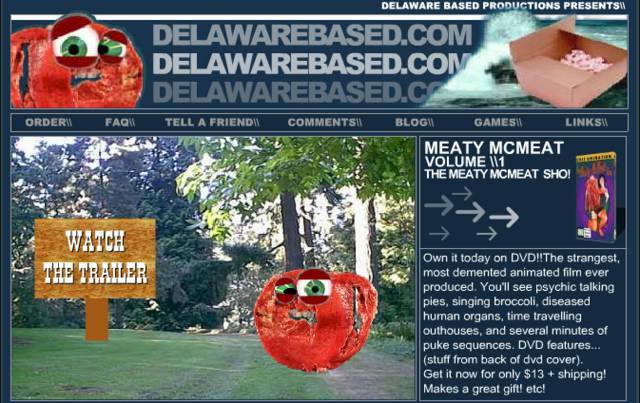 It's `The Meaty McMeat Show'. It's very dumb, poorly animated and oddly very funny (I imagine a few cones wouldn't go astray in watching it)Go there and have a look it's mighty silly. "STOP TALKING TO MEE!! DON'T PATRONISE ME!! I'M NOT GOING TO EAT THAT - NOW WATCH THE FRICKEN MOVIE!! " Overheard from the projection booth `Cinema 1' at the `Headcase' Cinema, Newcastle.